It is with great pleasure that I am able to include this clip on loosehandlebars, it’s been a while coming & it is certainly worth the wait. We have championed the Gatefolds since their first live gig in March 2013. Not only because my friend Joe Brown is the bass player but also because, in the fine tradition of guitar bands out of Derry, Northern Ireland, they made a most acceptable racket. A major highlight of a memory-packed first night in Derry was seeing the band play live. I’m now happy to call all 4 Gatefolds friends, it’s been a pleasure to follow their progress through the videos made by Derry documentarist Jim Cunningham & the receipt of care parcels containing new recordings. Now we have the first professionally shot & edited filming of the band in action & it’s very good indeed. At the end of April I made the 300 mile journey from my home to the Western edge of Europe to experience my second Gatefolds gig. The guys, a proper Garage band, worked hard in drummer Sean’s garage before returning to playing out & it showed. The guitar interplay of Jason & Fergal flows & surges at all the right times, the rhythm section, Joe & Sean, bring it in subtly & bring it home powerfully. It’s the unity, the 4 of them knowing how the Gatefolds should sound, that is the most impressive. I look forward to hearing studio versions of the new songs. Over at BBC Radio Foyle presenter Stephen McCauley’s “Electric Mainline” show champions independent music & the local scene. He invited the Gatefolds along to play 2 of their tracks & “Disappearing Act” was caught for posterity. My trip to Donegal was totally worth it (I got a tune dedicated to me, thanks guys). Click on the link & you’ll get a taste of the rocking good stuff. The best way to get the lowdown on a new young band is to ask a real young person. Keeping it in the family Emmet Brown, son of Joe kindly accepted our invitation to join the ‘handlebars’ karass. Emmet is the Antichrist. (“What ?”…Really ?”…OH !) Strike that, Emmet is an anarchist…phew ! “The word ‘touts’ may have a significantly different meaning in the north than it does most places. Defined as ““someone who betrays a confidence. To squeal, to tell tales, to inform the police of illegal activities”. With a name like that they’re already off to a brave start. 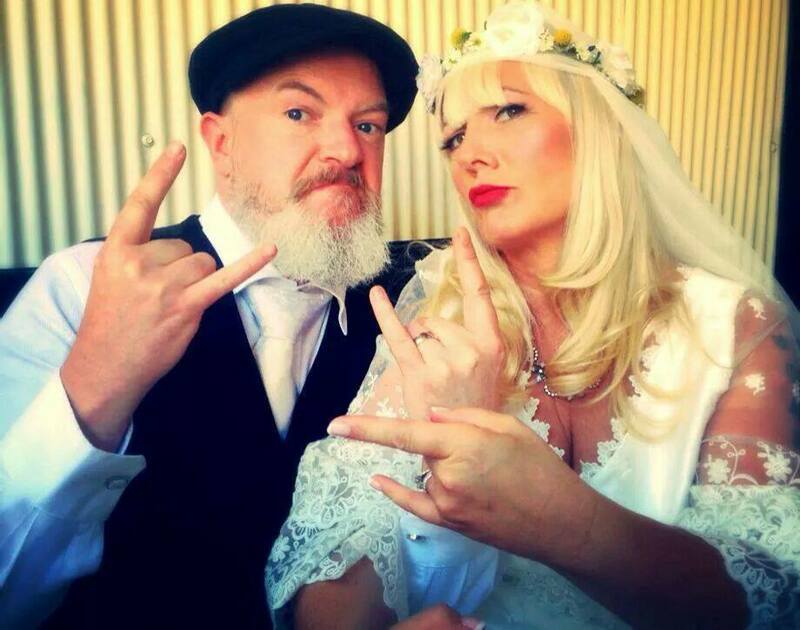 With their debut EP “Sickening & Deplorable” its not hard to see where their influences lay. Channeling the power of legends such as the Clash while having the speed of American punks such as early Descendents. I saw them playing in The Camden Assembly (Formerly the Barfly) in April. I was instantly blown away by their intensity and power. Guitarist and Vocalist Matthew would try to engage with the audience between songs but no one could make out his thick Derry accent. I found this hilarious as I looked around the room at confused faces. I hope that Paddy Nash doesn’t mind me describing him as a stalwart of the Derry music scene as he’s a big man & I’m in bad shape. Way back at the end of the 20th century his group The Whole Tribe Sings made a single “Happy” which was used in a beer commercial, got them gigs in the US & it could have been, even should have been. After a long break Paddy returned with the Happy Enchiladas as his backing band & there are 6 albums of their sparky, Rock-Folk around. I often encounter Paddy’s name & music through his involvement with local musicians & many community-based projects. This month a solo LP, “Gate Fever” is released. 10 tracks recorded in 6 days it’s a mature collection, sometimes introspective, sometimes retrospective, vignettes & character studies accurately captured. If the songs are a little downbeat well, these are the times we live in & Paddy’s lyrics are studded with warmth, hope & beauty. I feel that I’m listening to an Irish version of John Prine & that’s no bad thing. There’s an interesting video for “We Are The Dead” just up there. If you click here you can listen to “Gate Fever” & buying it is just one more click away. My good friends The Gatefolds, I only used to know the bass player but now I’ve had the pleasure of meeting those other 3, took their place on the bill at Sandinos regular “The Long Good Friday” shindig which, for 10 years now, kicks off Derry’s Easter musical weekend. The ‘Folds ended 2015 on a high, playing before their biggest audience yet when supporting hometown heroes the Undertones on their Xmas return to the city. I’m told that Sandinos, a friendly, funky rock & roll bar, an essential pit-stop if you are ever lucky enough to visit Derry, was rammed for the evening. “Reason” is a new song, more punchy pop-psyche, great guitar/vocal interplay from Jason & Fergal with drummer Sean giving it plenty. In the Gatefolds’ style the song is tight, energetic, no fol-de-rol or gasconade (that’s a real word !). I’m loving it. Thanks again to documentarist Jim Cunningham for pointing his camera in the right direction.The band have been busy in the studio finessing a new CD single. I have an early version of the 2 songs which sounds fine but if you’re gonna do it, do it right, they hope to have it available in mid-April. I receive regular musical care packages from the guys & if the next one includes a demo of “Reason” then that would be a lovely bonus. Headlining “The Long Good Friday” were the Bonnevilles, a guitar/drums duo from 70 miles up the road in Lurgan. Andrew McGibbon (voice/guitar) & Chris McMullan (drums) make a mighty Garage Blues noise. This month sees the release of their 3rd LP, “Arrow Pierce My Heart”, their first for 4 years. Alive Records have made 4 tracks available on the Y-tube (a tough call which to feature here) but be careful, if you give any of them a listen then you will have to hit up the Bonnevilles’ website to find out how to buy the whole thing. It’s inevitable that their line-up invites comparison with the Black Keys. If that’s got to be done then it’s the early Keys, y’know, when they were good. Myself I’m hearing the rawness & drive of those 90s Fat Possum LPs from R L Burnside with added power & drama. The Bonnevilles are sure to be gigging far & wide in support of “Arrow…”. If you are lucky enough to be in the right place at the right time then you will know about it. Now this is another drop of the good stuff. In 2015 Lady J released an LP that is still played regularly around here. In September I caught the band playing live & it wasn’t just the guitar, bass & drums, turned up to 11, that shook the walls of the club. Singer Jeanette Hutton is a rocker through & true. She thrives on having that big noise behind her & has the power to ensure that she is heard over it. Earlier this month 3 of the 4 members of the band visited Northern Visions TV in Belfast to record an acoustic session. Drummer Little Hooks switched instruments to provide, with Marty McGill, a double guitar accompaniment to 5 of the songs from the record. It’s a pleasure to have such a high quality capture of the set. The songs are strong enough to be stripped back & even though Jeanette is seated she still delivers her lyrics with impressive power. Unplugged ? I don’t think so. I’m back in Derry at the end of April for more musical adventures, meeting up with new & old friends. It’s Gonna Happen…can’t wait. On September the 10th the Derry musical family assembled at Sandino’s bar for the “Music For Free Movement” concert, part of the positive public response to the distress suffered by refugees fleeing the warring factions of the Middle East. It was not difficult for co-promoters Kevin Magee & Rion McCartney to fill the bill, many musicians in the area wanted to contribute to the evening. The hard part was stage managing the night to give as much time as possible to each act. Two stages featured over 5 hours of continuous music & it was not easy to catch all the great talent from the city showing out for a very good cause. I did my best. It’s been over 25 years since I worked alongside & played out with a fine group of men from Ireland. 3 of them were in a band & I travelled around the country with Bam Bam & the Calling not only to see that they didn’t get lost but because they made great music. This new-fangled e-world put me back in touch with 2 of the guys & wonderfully the group was intact, back in Derry, still making their terrific racket. Bassist Joe Brown plays with a new crew, the Gatefolds. I was able to see their live clips, receive their CDs & help to spread the word by way of this blog. An opportunity to see both the Gatefolds & Bam Bam play on the same night was too good to miss. It was time to plan my first visit to Northern Ireland. From home to Derry took almost 10 hours, a cab, a train, a bus, a plane then a bus ride from Belfast across some rather green & pleasant land. The gang at Cool Discs, an aptly-named record shop, provided a welcome & a place to put myself on solid ground. Kevin Magee took time from a very busy schedule to point me right (a shout to the Cafe del Mondo) in the Walled City. A long day was surely leading to a long night. Sightseeing could wait, it was the music that had brought me here. First up at Sandino’s was Lost Avenue, the youngest band of the night. 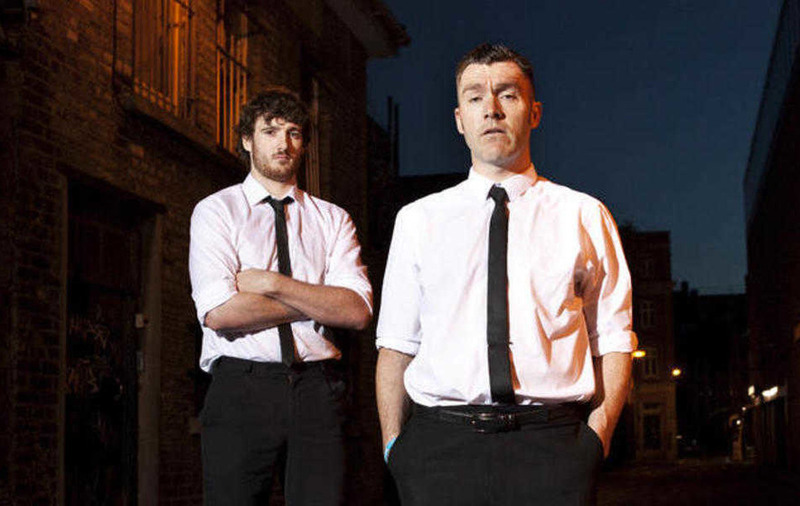 Derry’s rock tradition has the clang & clash of loud guitars & these guys fit right in. They deserved a bigger crowd & get them for their own gigs as their reputation grows. More great music followed while the venue, a classic Irish ballroom (easy access to alcohol is a clue) with a traditional rock & roll sticky floor, filled up with faces from my Facebook feed. Bernard & I had already bonded over our similar tastes in music & football. Jim Cunningham, the documentarist of Derry music, arrived with his camera. Jeanette & Ruairi are as delightful as I knew they would be. Later their band, Lady J, would absolutely rock this joint. Everybody was so welcoming (not always the case for me ! ), I don’t get around as much as I used to but I know that this must be the place when I’m in the middle of good people & good music. So here are the Gatefolds, right onstage in front of me. Drummer Sean & guitarist Fergal were, until tonight, e-friends, singer-guitarist Jason & I had never met before & that didn’t matter. There’s my old mucker Joe on bass & I’m watching him doing what he does for the first time in over 25 years. The Gatefolds know that increased volume isn’t the only way to have an effect. Their spiky, still melodic, riffs insinuate themselves rather than batter you. The pop-psych guitar wash builds beautifully, there are times when I could happily listen to them stretch these songs for as long as they are inclined. I had seen the clips, have the few songs the band have recorded, this was better. In the last week the Gatefolds played to their largest audience yet while supporting the Undertones & I have received a new CD single. 2016 looks like being a good year for them. I took a breather, caught an acoustic set by the Wood Burning Savages, a group I’ve known about for some time & a fine one. Sandinos was packed with shiny happy folk, some of them curious about a stranger’s story. Man, I like to talk but I was 18 hours into my day & the headline act, the reason I was out of my bed so early & had travelled so far to see were about to hit the main stage. Bam Bam & the Calling have played together for over 30 years now. The same line-up. Tonight a family illness had prevented guitarist John McLuskey from attending but Paul, Joe & Tom, ably assisted by Paul’s brother Rion, were still there. It’s more than longevity that has established their reputation as Derry music legends. Paul Pj Mc Cartney has some great songs & is a charismatic front man. Drummer Tom Docherty is just a machine, I think that I had forgotten just how good he is. What I had not forgotten, what had first attracted me to the band & what was still there was the unit’s commitment to playing with passion & energy because that’s why they did it in the first place. The old songs were a blast, the newer ones just as good. The set whizzed by too quickly, my central nervous system overloaded with endorphins producing the widest smile in the hall. I wanted more but I’m greedy. I had waited long enough to hear this, I could wait for the next time. My long day had been worth every minute. Over £3000 was raised for people unfortunate to have been caught in a war & lucky enough to escape to the Greek island of Lesvos…good work. On my long weekend I reminisced, caught up with & spoke about Life with my 3 old friends. I made new friends too. Joe’s wife Gayle fed me, always a good thing. Fergal was already in every bar I entered. The hospitality shown by Kevin & Alison, who invited a strange man into their home, will never be forgotten (nor will Ali’s carrot cake). Good people, great old & new times. It was the music that brought us & kept us together over all this time. You have got to love that ! From the L to the R : the author, Paul Bam Bam, Kevin Magee, Joe Bam Bam. Short & sweet, “Temporary” is a new song from the ‘Folds. I’ve noted before that the band continue the tradition of fine, noisy guitar bands from Derry. There’s a crackling energy about this, straight ahead & no-nonsense but still a fine mix of head & heart. Anything that reminds anybody of early R.E.M. is a good thing. Let’s hope that the Gatefolds play regularly this summer because there’s more to be found in their songs. “The Decorator”, half of their last double A-side single, which you can have for your very own by visiting Bandcamp, is, as you can hear, coming along very nicely. The previous weekend had marked the 50th birthday of Paul Pj McCartney & the great & good gathered to mark this milestone. Paul has been an influential part of the Derry music scene for the majority of that half century. The night would not have been complete without a performance from Bam Bam & the Calling, the band which has played & stayed together for 30 years now. The other 3 members, Joe Brown (bass), John McCloskey (guitar) & Tom Doherty (drums), had rehearsed without Paul for this special, surprise gig but all 4 know how the Bam Bam sound goes, how exhilarating & exciting music should be. The band were joined onstage by Raymond Gorman off of The Everlasting Yeah, an original Bam Bammer, for a set of Greatest Hits & covers of the Velvet Underground, Television, Plastic Bertrand…all the greats. This set is 40 minutes long & you are all busy people. Seriously just dig into any part of this clip (Raymond plays at the end) & you will find proper, raucous rock & roll played by men who remember the reasons why they started this way back when. They are all making their contribution to this great noise. It’s good to see Tom out of the house & to be reminded that he is some kind of drummer. I have spent some of my most enjoyable musical days in the company of these guys, their performances endorsing that they absolutely walk it like they talk it. Paul still has the sharpest ears around, excavating treasures from then & now for our consideration. Big congratulations on his landmark birthday. We have been friends for a long time & long may this connection continue. Stepping up to the plate is Fergal Corscadden, lead guitar grappler of The Gatefolds, a man with undoubted taste in music & questionable taste in football clubs. Fergal has been our psychedelic correspondent for some time now. He has turned us on & tuned us in to some fine music. I’m sure that Fergal will be spending a quiet holiday period with his family, saving his energy for the 3rd of January when the Gatefolds launch their new single “Smokin’ Pockets” with a gig at Sandinos in Derry. A guaranteed good resolution-breaking night. He has elected, in the tradition of the Miss World contest, to announce his results in reverse order. Crazy ! 3. Thurston Moore – “The Best Day” (October). OK, first up and 3rd, kicking Papir’s 4th album (“IIII”) into 4th, Thurston Moore needs no introduction. For his first song collection since the break up of his group & his marriage he has assembled a tidy bunch of musician friends including bassist Debbie Googe (My Bloody Valentine) & guitarist James Sedwards (Nought/Chrome Hoof). Drummer Steve Shelley abides from Sonic Youth & if you’re a fan of that band, which I am, you get the same sound and vibes (man). Track 1, “Speak To the Wild” will set you right. In 2013 Lee Ranaldo and the Dust’s “The Last Night On Earth” had some decent sounds on it too, retaining a SonicYouth(iness). The same cannot be said of the massively experimental ‘Coming Apart’, the debut album from Body/Head, aka Kim Gordon and Bill Nace, which is interesting but not as immediate as Moore nor Ronaldo. I look forward to a post-Sonic Youth jam playing all 3 artists at the same time, just for the craic. In fact I’ve just done that on the Y-Tube. Fugazi make the number 2 slot. I’ve loved everything about this band and their music since the early 1990’s, and they haven’t released anything in 13 years (album-wise) so I was pleasantly surprised to say the least by the news of this one. Ah, band demos… the real stuff. A chance to listen to the similarities in sounds carried through and those they’ve enhanced over the years. There are a lot of differences here and the obvious similarities (mainly in song structure, minimal effects in this release as a difference), compared to the eventual, much tighter, studio recorded versions that we as fans have since and continue to enjoy. But the best thing about this is that it sounds decades better than a whole lot of 2014 material that is supposed to be ‘contemporary’ and in this genre, whatever that might be. 1. 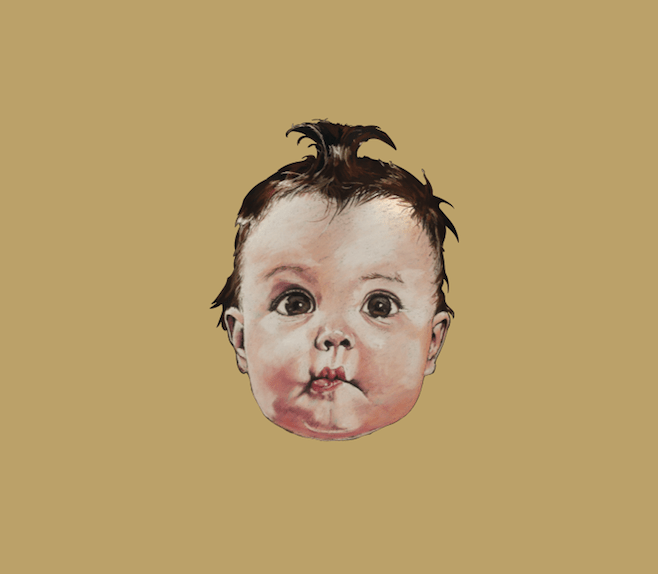 SWANS – “To Be Kind” (June). Ok, next up is another 80’s band and I’m a latecomer to SWANS. Having never listened to any of their massive discography, until a couple of years ago I’m a huge fan. They’re not everybody’s Cuppa Charlie, but I get them/it and I like it a lot. It has taken me a good few spins but I got there with this, their 13th record, too. The band have had a lot of changes line-up wise mainly in the rhythm section but this hasn’t affected their sound…but who gives a fook…jeeze The Fall hi!…consistency however in terms of band members and sound, depth and breadth of sound since reforming in 2010, make this album ‘To Be Kind’ a much listened to 2014 release. Other notable shouts out for Hookworms & Mogwai (Top 3 F, that’s 6 now, one a triple LP !). Lots of listening to do, Merry Christmas etc. Oh yes, our favourite psyche-pop noise garagists, the Gatefolds, are back. They played their first gig for a while over Easter. The Derry quartet were again part of “The Long Good Friday”, a get-together at local joint Sandino’s on…erm, Good Friday. I had been promised new songs by the band & here is that very thing. “Opentight” shows that rehearsal time at Woodbrook Studios (OK…in drummer Sean’s garage) has been well spent. There are 4 new clips on the Y-tube from the Gatefolds’ set which highlight the solid & sweaty rhythm section alongside a little more contrast, chiaroscuro (come on !) in the guitar interplay of Jason & Fergal. I am loving it. Now I am over 250 miles away from Sandino’s. It is thanks to the archivist of the Derry music scene, Jim Cunningham, that I am able to see & hear my friends. Jim’s pursuit of what is obviously his passion means that he was getting busy with both his regular & video cameras. I know that a fine Bank Holiday crowd showed out for the gig because there is an album of a gang of shiny happy people enjoying the first day of a long weekend. I also know that the calls for an encore were loudest from Gayle, Foldette #1, who is lucky enough to be the partner of bassist Joe Brown. Nothing escapes the discerning eye of Mr Cunningham. The other new song is “Smoking Pockets”, the set’s closer but, as the head honcho around here, I get to decide that we will get back to that one. It’s a considered opinion because “Volts & Watts” has come on a treat since I last heard it played. It’s a tune that people say good things about & now it is proper rocking, a grab-your-attention opener which has gotten tighter with time spent on it without becoming too smooth. I understand the guys are hoping to produce a DIY single this year. I’ve been down to my local bookies (Paddy Power, of course) & put a few shillings on “Volts & Watts” being featured on this anticipated artifact. One day I will get it together & be stood next to Jim while he films. That looks like a great night. Those British City Halls, expressions of municipal grandeur & civic pride, were around before rock & roll was invented & now provide a classy setting for any band. How about those Woodburning Savages…cooking with gas ! There was more to come in a packed musical weekend. On Easter Monday Jim used his season ticket at Sandinos to document Conor McAteer’s gig. He probably made some moving pictures too, give the man a break, he’s been busy. There are now over 200 videos on Jim Cunningham’s Y-tube channel. You are all capable of finding your own way there but you can also click this. Jim has produced a serious video & photographic archive of the contemporary Derry music scene. Someone should get hold of it, make it nice & put it in a safe place because it is a repository of fine memories for a generation of Derry people. I have just found out that today is, in fact, Jim’s birthday. So have a great day Jim & know that that thing you do is appreciated by musicians & audiences alike. Nice work fella… keep on keeping on. We are just a week into the new year & I’m bumping into brand new music already. I am keeping my powder dry on the Sky Ferreira/Ariel Pink collaboration. It may be a sparky glam collision or a 3 day wonder or they may try to make Ms Ferreira go to rehab…we shall see. One thing we can be sure of is that the Gatefolds first gig of 2014, at Sandinos in Derry last Saturday, was a bloody good night out. Once again Derry’s devoted documentarist, Jim Cunningham, was in attendance to capture the three bands & the audience. For myself it’s a real buzz to see such recent photographs of friends I have known for 25 years & others who only made contact in 2013. If you have any interest in current Irish music (if an artist comes to Derry, Jim will be pointing a camera at them) then get yourself to Jim’s Y-tube channel (jcee) which has become an impressive audio-visual anthology of what’s going on in the second city. “Cupcakes” by our boys certainly helps to shake off any post Winter Festival languor. It’s great to see drummer Sean sitting upright after 10 days passed out on the sofa ! I really do like the ‘Folds’ pop with a punch. It feels like it is a continuation of an established Derry musical timeline. The bam-bam guitars have undertones of a petrol emotion & that is a good thing…you get me. In 2013 a CD, “Six Strings & Stigma” featured 14 bands from the Derry music scene. Produced & curated by Ruairi O’Doherty the original & varied songs were concerned with mental health & any funds raised supported Northern Irish organizations working in that field. It really is a cracking listen, the Gatefolds contribute a belter, “The Last To Speak” & there is a solid quality throughout. I have a copy, if you would like one for yourself then the Facebook page will point you in the right direction. One of the highlights of “6 Strings” is “Waiting On A Rainbow”, a self-written song by Jeanette Hutton with a lovely Celtic strength & the assured restraint of music more concerned with emotion than with display. Jeanette (” a gem… one hell of a voice” said a correspondent) has been a fixture on the Derry music scene for some time & on Saturday her new band Lady J played out at Sandinos. Ms Hutton has traded her acoustic guitar for a Telecaster & on “Turn Me Over”, things are looking nothing but good for the band. Providing drums & a most impressive beard for the band is the aforementioned Mr O’Doherty. 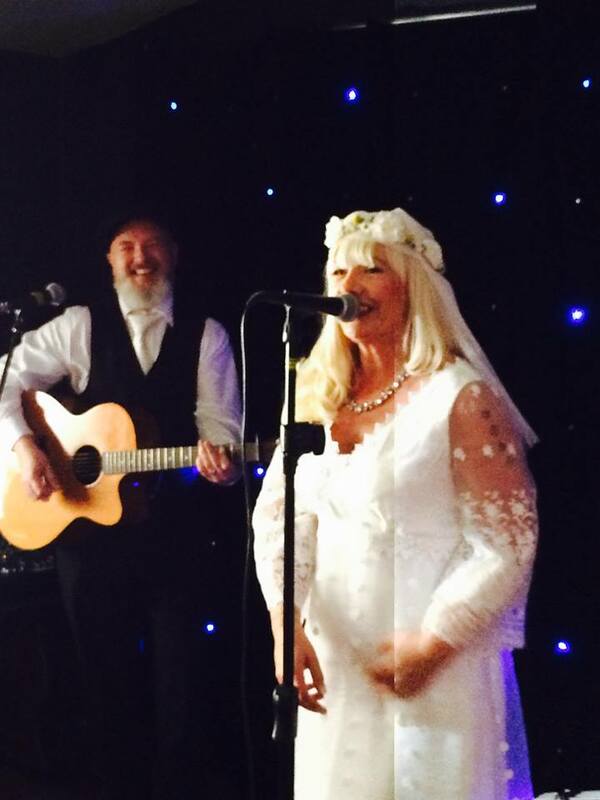 Jeanette is lucky enough to be marrying Ruairi in the summer so let’s hope that their year is filled with luck, love & music. I like Lady J. Well all right ! There was big love for “Volts & Watts”, the set closer on Saturday night. Deservedly so…the tune has great attack. I know that at least a couple of the band do have lysergic musical leanings. I’m sometimes surprised (relieved ?…I’m joking) when Fergal & Jason resist the attraction of the space opera & keep it tight because that psychotomimetic thing is certainly hanging around..oh yes. Our cameraman was probably beating the rush to the bar so this clip is from October when the Gatefolds launched their single on Nervous Pulse Records. It’s almost a year now since the first tracks by the band turned up on Bandcamp. There has been good music to discover & Mr Cunningham has allowed me to check for the gigs. It’s nothing but a pleasure to hear the new tracks & to help spread the word about the Gatefolds. These 2 tunes need to be sorted & recorded, more live sets to be played. If I made a list of stuff that I look forward to in 2014 (I don’t, I’m not that lame) then hearing from the Gatefolds & the fine musicians in Derry, is up there with 3 points on a Saturday & other good things. Finally, Joe Brown waves his arms in the air, waves them like he just don’t care. What was he thinking ? Well the days fly by. You gotta get involved. When you are caught enjoying a moment of silence & solitude you’re regarded as an oddity for even considering such a waste of time. You know the Earth is rotating at over 1000 m.p.h. Life is quite fast enough for me thank you. It’s inevitable that I miss some of the good stuff. I’m a lucky guy because I have all round top Derry feller, bass player off of the Gatefolds, Joe Brown to gently nudge me towards great music that could otherwise have passed by unnoticed. Here at the loosehandlebars nerve centre we extend a corybantic (oh yes !) welcome to our guest selector & his choice of some of 2013’s finest. Tune in, turn on & drop everything. Take some time out to feed your ears & your head. First up it is Chris Forsyth & the Solar Motel Band with one of the 4 tracks from the “Solar Motel” suite. Back of the net ! A brilliantly fluid psychedelic guitar adventure which takes it time & gives itself permission to stop & smell the flowers along the way. Forsyth has spent time with Richard Lloyd who’s guitar fraternity with Tom Verlaine made “Marquee Moon” one of the great LPs of our music. Television’s name will be dropped into anything you hear about “Solar Motel” but hold on there muskrat, it is, of course, not as straightforward as that. Back in 1977 I thought that Television had been listening to the Grateful Dead but, y’know, the Punk Wars were still being fought. The idea that this new classic owed something to a band of hippies was never going to be popular. I kept quiet about the sinuous, sometimes telepathic confederation of Bob Weir & Jerry Garcia. Maybe the Dead are due a resurrection…Hey kids, here’s a tune called “Dark Star”. When you have picked the bones out of that there are 3 or 4 triple live LPs over there. Chris Forsyth has finished with them now. The Villagers made a big impression on their recent visit to Derry. “(Awayland)” is the difficult 2nd LP. After the brooding one-man band of a debut the Villagers are now a group, with a fuller sound, drum machines, a sampler, 21st century stuff. “Classic Rock” just ain’t as classic as it used to be. The bloodless mediocrity of the likes of Coldplay or the Killers, that ersatz Mumfordian folk nonsense, gives the mainstream a very bad rep. We need confident, original, radio receptive music which looks forward & avoids the obvious. This could be that thing. It helps that Conor J O’Brien writes a more than decent song. It’s the Villagers, “The Bell”. 2013 has been a good year for good music. Brown’s Best includes Bill Callahan’s “Dream River”, the sound of an artist becoming consummate. I’m saving that one for myself. From his hometown there is the Wood Burning Savages & back in January he took a more than passing fancy to Yo La Tengo’s LP “Fade”. The Gatefolds are partial to the abracadabra of well honed psych drone so the final place on the podium is taken by San Francisco’s Wooden Shjips. Their video has nothing to do with the band but at just 5 minutes is creepier than the last 3 movies of M Night Shamalama put together. 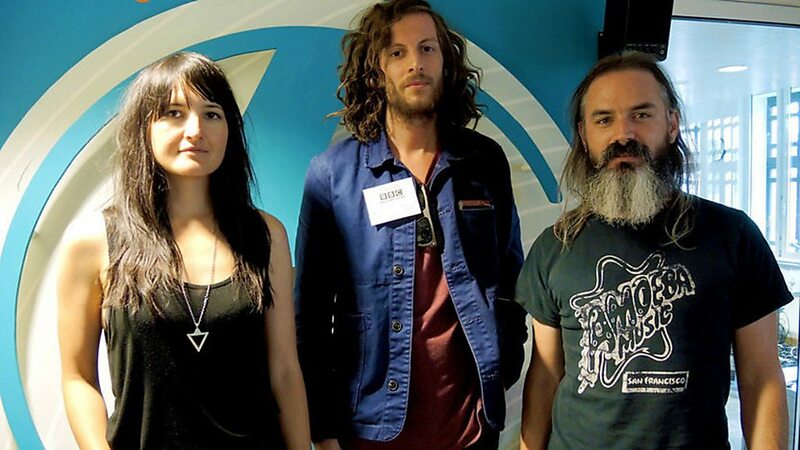 Last year Joe put us on to Moon Duo, a side project for the Shjips’ guitarist Ripley Johnson. We get to hear him at his day job here on the title track from the new LP “Back To Land”. This stripped back music tips its hat at some pretty solid influences. There are plenty of bands aiming to get the feel of German rock but this lot know what is what. This time round there is an added injection of the groove which, I find, can never be a bad thing. There’s a bit of this driving motorik guitar music about. The Shjips only get the nod this year because of a disputed offside decision against Parquet Courts. Next year Joe & myself have our money on The Everlasting Yeah doing that thing they do & reclaiming the title belt for Derry city. Well, that year went at over 1000 m.p.h. Give these tunes a shake & when your friends are impressed tell them that Joe Brown, the bass player off of the Gatefolds, put you on it. He does it for the love of the music not the glory but an acknowledgement would only be polite. OK, a week of 2013 left & a new year of listening starts. Anything could happen & probably will. Let’s hope so.